What can be done about all those garbage eagles? 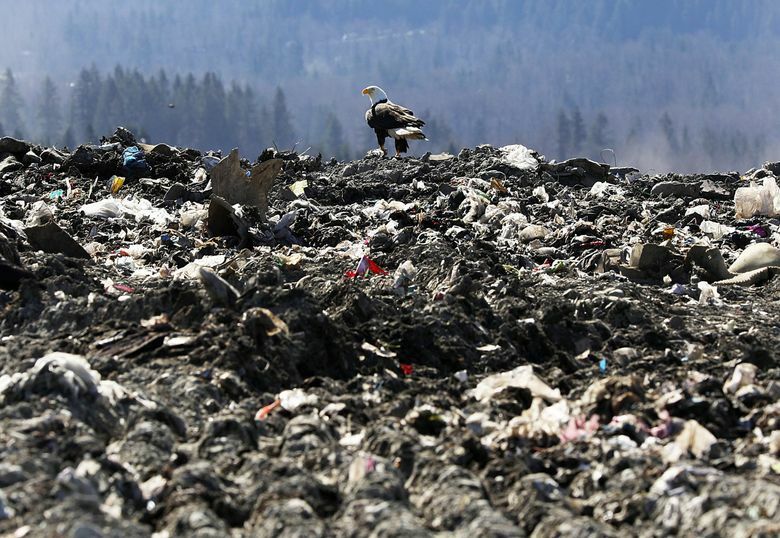 As the Metropolitan King County Council continues to mull how to best dispose of the 2,500 tons of trash deposited daily at the Cedar Hills Regional Landfill near Renton, one thing they’d like to see is a plan to better manage the hundreds of bald eagles that haunt the landfill, feasting on the refuse. About 200 bald eagles frequent the landfill, perching on trash and diving between bulldozers to pick out choice morsels. There are adult eagles, with their distinctive colors. And there are juveniles, their heads not yet white, with mottled brown and white feathers. The landfill is nearing capacity and has been for decades, but the county’s new Comprehensive Solid Waste Management Plan would push the estimated closing date back to somewhere around 2040 by spending up to $270 million expanding the landfill at the site. The county council Monday amended the plan, sending it back to committee ahead of a possible final vote in the coming weeks. Dunn said he’d let the experts focus on the possible solutions, but he had in mind things like netting or various kinds of coverings. Neighbors of the 1.4-square-mile landfill are passionately opposed to expanding it, arguing that the county has repeatedly said it would be closing the landfill, only to repeatedly push back the closing date by decades. King County’s landfill has been almost full for two decades. What happens next? Their concerns include smell, greenhouse-gas emissions from the decomposing garbage and potentially toxic liquids leaching through the oldest parts of the landfill to the aquifer below. One model used in a 2016 draft environmental report predicts that fluids could seep through the ground beneath the oldest sections of the landfill to the aquifer by 2058. But among their more pressing concerns are — the birds. David Vogel was one of nearly 80 people to speak at a public meeting last month, all against extending the life of the landfill. He stood before the county council and held up, inside a carefully sealed Ziploc, a biohazard bag containing human blood that he said he’d found in his yard, just west of the landfill property. King County is not alone in attracting our national bird to our local garbage. A 2015 study in the Chesapeake Bay area found that “landfills may serve as important scavenging sites for hatch-year and second-year eagles,” while older birds may be more self-sufficient. Vancouver’s landfill has more than 2,000 eagles during peak times. But, a 2005 study found that Vancouver’s landfill eagles “used the landfill primarily as a site for resting during inclement weather,” as it’s protected from the wind and slightly warmer than surrounding areas. Bald eagles were removed from the Endangered Species Act list in 2007, but they are still protected under federal law, which makes it a crime to shoot, trap, molest or disturb the birds. Pat McLaughlin, the county’s solid-waste director, said they had previously tried different tactics to deal with different birds. The increasing number of eagles — a predator — has coincided with a dwindling number of seagulls at the landfill, McLaughlin said. Last year, they tried drones to try to dissuade birds from hovering over the garbage. “The eagles were so aggressive to the drones, they tore it up out of the sky,” McLaughlin said. They’ve had moderate success by putting a safety vest and hard hat on a mannequin. Birds will steer clear of the scarecrow but won’t leave the landfill entirely.